Elliott G, Doll B A, William F F, Schmitz J P, Hollinger J O. Demineralized bone matrix in bone repair: history and use [J]. Advanced Drug Delivery Reviews, 2012, 64(12): 1063-1077. Catherine Z. Tissue engineering: the beat goes on [J]. Nature, 2003, 421(6926):884-886. Lee J, Cuddihy M J, Kotov N A. Three-dimensional cell culture matrices: state of the art[J]. Tissue Engineering Part B-Reviews, 2008, 14(1): 61-86. 肖春生, 田华雨, 陈思学, 庄秀丽, 景遐斌. 智能性生物医用高分子研究进展[J].中国科学 B辑:化学, 2008, 38(10):867-880. Vasir JK, Tambwekar K, Garg S. Bioadhesive microspheres as a controlled drug delivery system[J]. International Journal of Pharmaceutics, 2003, 255(1):13-32. 廖月娥, 刘天西. 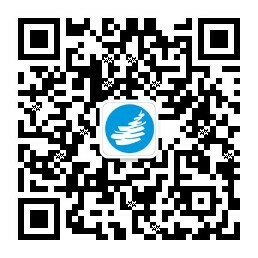 基于静电纺丝技术的多级结构聚合物纳米纤维复合材料的研究进展[J].高分子学报, 2012, (8): 801-811. 丁彬, 斯阳, 洪菲菲. 静电纺丝三维纳米纤维体型材料的制备及应用[J].科学通报, 2015, 21(60): 1992-2002. Martino S, Angelo F, Armentano I, et al. 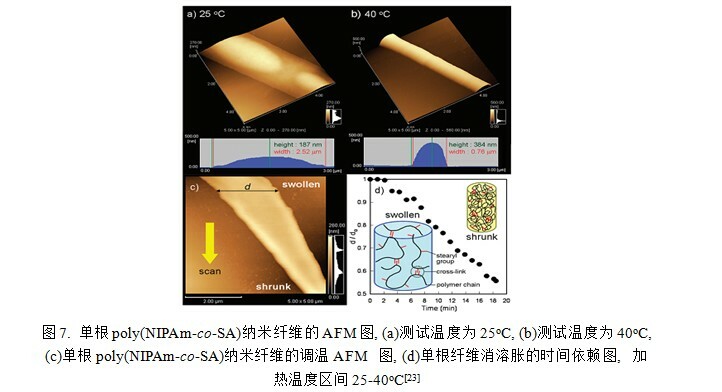 Hydrogented amorphous carbon nanopatterned film designs drive human bone marrow mesenchymal stem cell cytoskeleton architecture[J].Tissue Engineering Part A , 2009, 15(10): 3139-3149. Wu Q, Wang R, Zhou Y, Huang Y Q, Ghosh R, Chen X N. Poly(N-isopropylacrylamide)grafted dual stimuli-responsive filter paper for protein separation[J]. 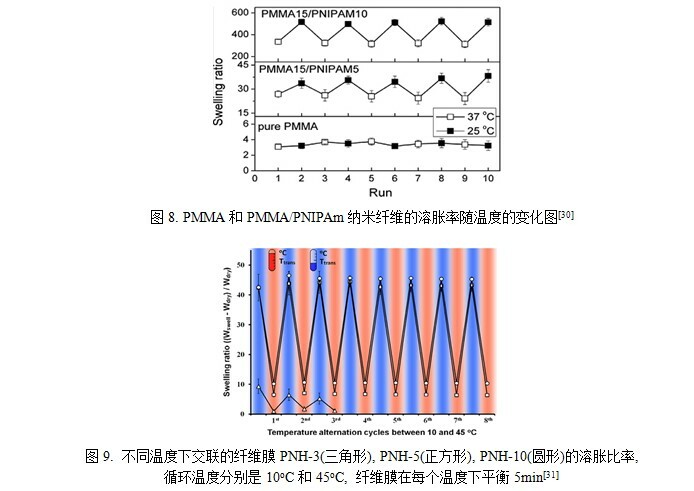 Chinese Journal of Polymer Science, 2015, 33(7): 1048-1057. Na G, He Y, Kim Y, Lee M. Switching of carbohydrate nanofibers for regulating cell proliferation[J]. Soft Material, 2016, 12(11): 2846-2850. Ganta S, Devalapally H, Shahiwala A, Amiji M. A review of stimuli-responsive nanocarriers for drug and gene delivery[J]. Journal of Control Release, 2008, 126(3): 187-204. Fasano V, Baroncini M, Moffa M, Landolo D, Camposeo A, Credi A, Pisignano D. Organic nanofibers embedding stimuli-responsive threaded molecular components[J]. Journal of the American Chemical Society, 2014, 136(40): 14245-14254. 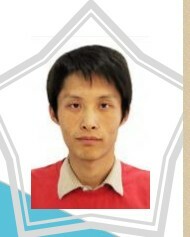 Niu X F, Feng Q L, Wang M B, Guo X D, Zheng Q X. In vitro degradation and release behavior of porous poly(lacticacid) scaffolds containing chitosan microspheres as a carrier for BMP-2-derived synthetic peptide[J]. 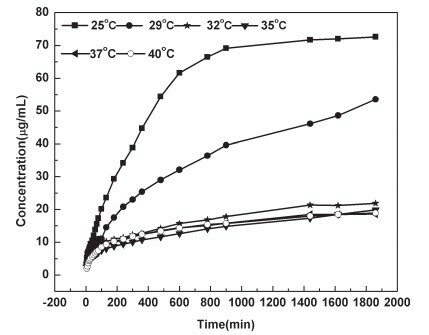 Polymer Degradation &Stability, 2009, 94(2):176-182. Yao L, Swartz D D, Gugino S F, Russell J A, Andreadis S T. Fibrin-based tissue-engineered blood vessels: differential effects of biomaterial and culture parameters on mechanicals strength and vascular reactivity [J].Tissue Engineering, 2005, 11(7-8):991-1003. 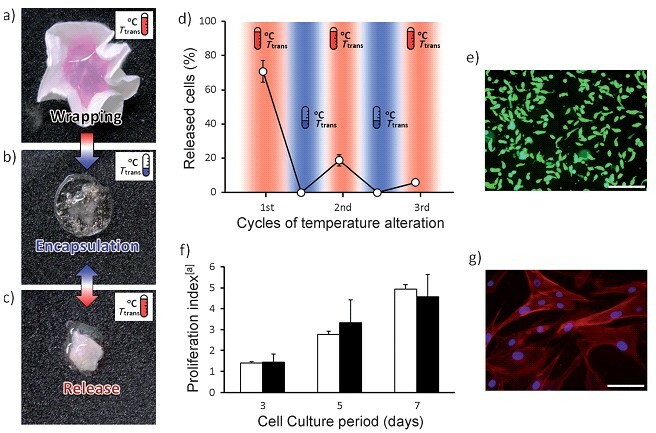 Dang J M, Leong K W. Myogenic induction of aligned mesenchymal stem cell sheets by culture on thermally responsive electrospunnanofibers[J]. 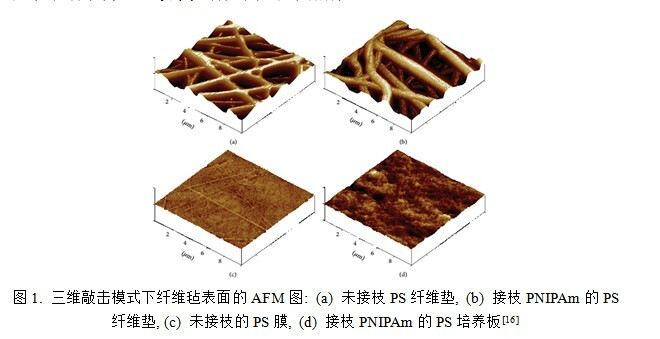 Advanced Materials, 2007, 19, 2775-2779. Oh H H, Ko Y G, Uyama H, Park W H, Cho D, Kwon O H. Fabrication and characterization of thermoresponsive polystyrene nanofibrous mats for cultured cell recovery[J]. Biomed Research International, 2014, 2014(3): 6-6. Chen L N, Chiu Y C, Hung J J, Kuo C C, Chen W C. Multifunctional electrospun nanofibers prepared from poly((N-isopropylacrylamide)-co-(N-hydroxymethyacrylamide)) and their blends with 1,2-diaminoanthraquinone for NO gas detection[J]. Macromolecular Chemistry and Physics, 2014, 215(3): 286-296. Rossouw C L, Chetty A, Moolman F S, Birkholtz L M, Hoppe H, Mancama D T. Thermo-responsive non-woven scaffolds for “smart” 3D cell culture, [J].Biotechnology and Bioengineering, 2012, 109, 2147-2158. 石萌. N-乙烯基己内酰胺温敏含糖共聚物纳米纤维的制备及其载药释放研究 (M) 上海东华大学 2013. 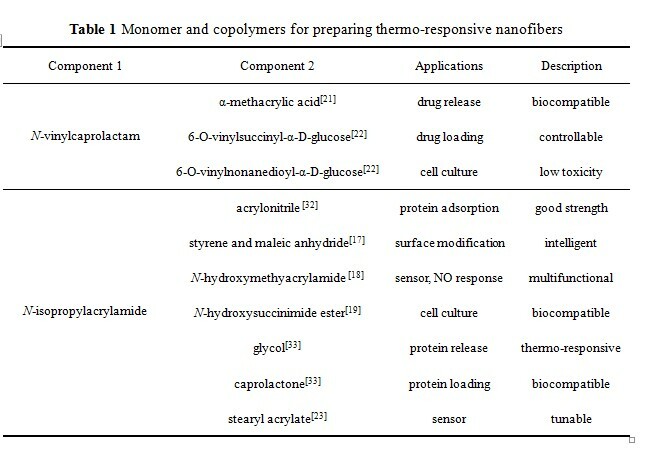 Okuzaki H, Kobayashi K, Hu Y, Thermo-responsive nanofiber mats, Macromolecules, 2009, 42, 5916-5918. 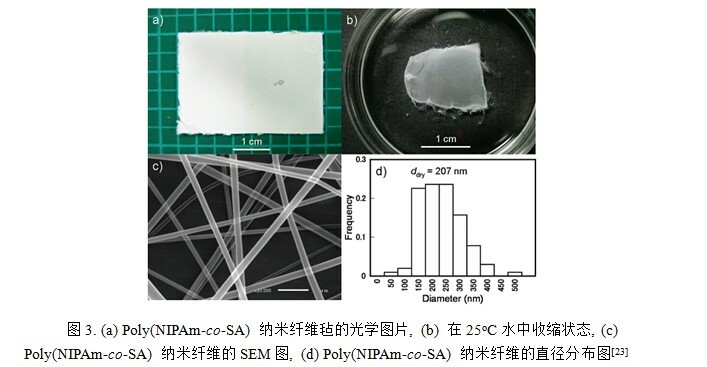 Gu S Y,Wang Z M,Li J B,Ren J. Switchable wettability of thermo-responsive biocompatible nanofibrousfilms created by electrospinning[J]. MacromoleculeMaterialsand Engineering,2010,295(1):32-36. Lin X L, Tang D Y, Cui W W, Cheng Y. Controllable drug release of electrospun thermo-responsive poly(N-isopropylacrylamide)/poly(2-acrylamido-2-methylpropanesulfonicacid) nanofibers[J]. Journal of Biomedical Materials Part A, 2012, 53(17):1839-1845. 胡娟, 李赫宇, 孙衎, 陶磊, 杨卉卉, 朱利民. 静电纺丝法制备温敏性PNIPAAM/EC复合纳米纤维[J].化工新型材料, 2016,41(1):80-82. Wang J, Sutti A, Wang X G, Lin T. Fast responsive and morphologically robust thermo-responsive hydrogel nanofibres from poly(N-isopropylacrylamide) and POSS crosslinker[J]. Soft Matter, 2011, 7(9): 4364-4369. 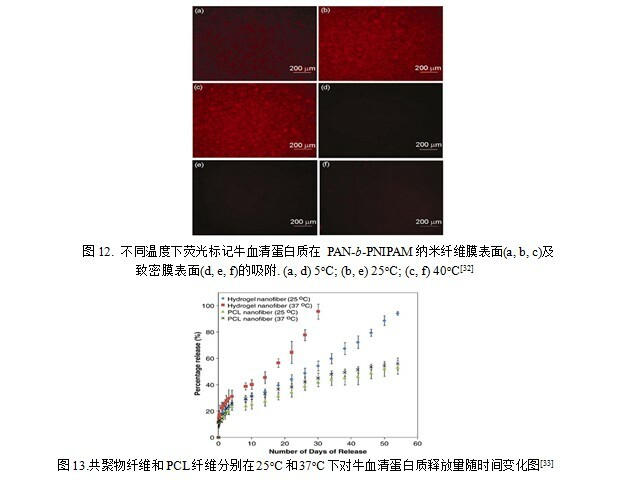 Shi Q, Hou J W, Xu X D, Gao J, Li C M, Jin J, Wong S C, Yin J H. Capture and release erythrocyte from the blood with thermo-responsive and core-sheath PCL/PNIPAAm nanofibers[J].Advanced Materials Interfaces, 2015, 8677(5): 577-580. Chen M L, Dong M D, Havelund R, Regina V R, Meyer R L, Besenbacher F, Kingshott P. Thermo-responsive core-sheath electrospunnanofibers from poly(N-isopropylacrylamide)/polycaprolactone blends[J]. Chemistry of Materials, 2010, 22, 4214-4221. Song F, Wang X L, Wang Y Z. Fabrication of novel thermo-responsive electrospunnanofibrous mats and their application in bioseparation[J]. European Polymer Journal, 2011, 47, 1885-1892. Kim Y J, Ebara M, Aoyagi T. Temperature-responsive electrospun nanofibers for on-off switchable release of dextran[J]. Science and Technology of Advanced Materials, 2012, 13, 064203. 万灵书, 王芳, 李晶, 雷浩, 傅磊, 徐志康. 温敏性丙烯腈共聚物纳米纤维膜的制备与性能[J].中国科学：化学, 2011,42(4):380-384. 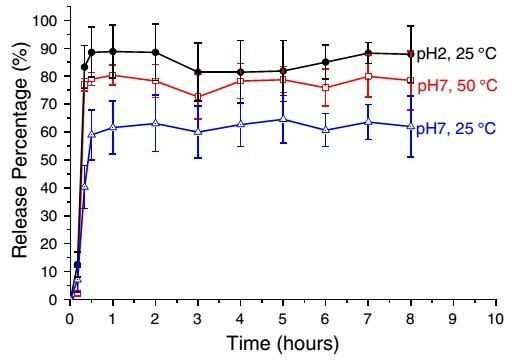 Loh X J, Priscilla P, Susan L, Colin S, Jun L. Controlled drug release from biodegradable thermoresponsive physical hydrogel nanofibers[J]. Journal of Controlled Release, 2010,143, 175–182. 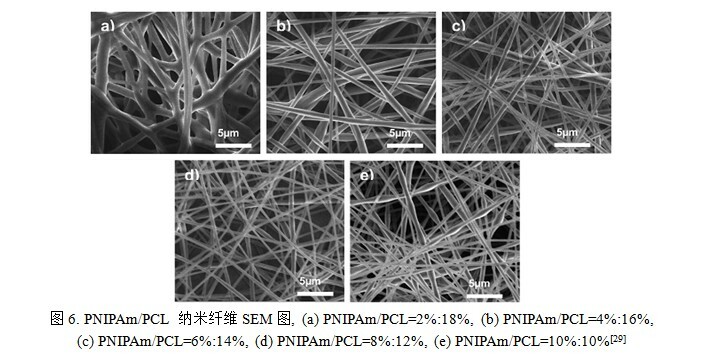 Zhang H W, Niu Q J, Wang N, Nie J, Ma G. Thermo-sensitive drug controlled release PLA core/PNIPAM shell fibers fabricated using a combination of electrospinning[J]. European Polymer Journal, 2015, 71, 440-450. Hu J, Li H Y,Willians G R, Yang H H, Tao L, Zhu L M. Electrospun poly(N-isopropylacrylamide)/ethyl cellulose nanofibers as thermo-responsive drug delivery systems[J]. Journal of Pharmaceutical Sciences, 2016, 105, 1104-1112. Huang C H, Kuo T Y, Lee C F, Chu C H, Hsieh H J, Chiu W Y. 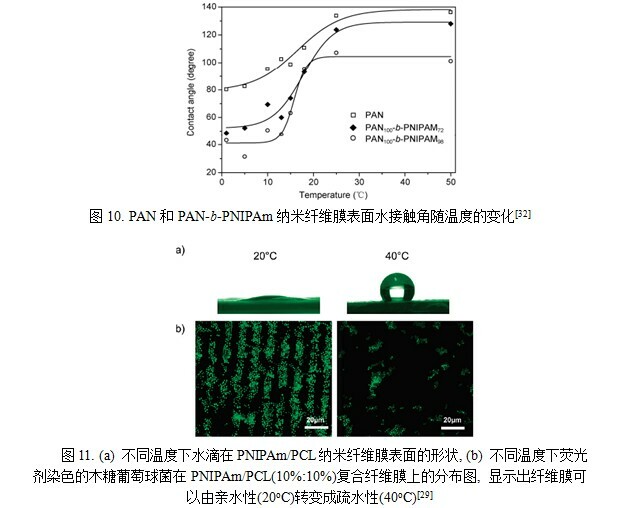 Preparation of a thermo- and pH-sensitive nanofibrous scaffold with embedded chitosan-based nanoparticles and its evaluation as a drug carrier[J].Cellulose,2014, 21, 2497-2509. Kim Y J, Ebara M, Aoyagi T. A smart nanofiber web that captures and releases cells[J]. Angewandte Chemie International Edition, 2012, 51(42): 10573-10541.